Here is a recording featuring the current Senior Vice President of Programming for iHeartMedia of the Hudson Valley (as of this writing). Chris Marino sounds GOOD in context on this, the early Hot Adult Contemporary version of 95.5 WPLJ. The songs heard as currents and recurrents in rotation at WPLJ in 1996 read like a modern Classic Hits station. This would fit well on today’s version of crosstown WCBS-FM 101.1! A bit of station history: WPLJ is one of those stations that’s just… there. Once WABC-FM in the 60s, WPLJ evolved into an early AOR and stayed there until late 1983 when it slowly evolved into CHR. It sounded great and for a time, even used some of the WABC Jam jingles resung for WPLJ. The CHR war evolved into a head on collision with CHR powerhouse WHTZ Z100, a war which WPLJ eventually lost. The station threw in the towel as a hit music station after it’s hottter-than-hell “Mojo Radio” incarnation (Thanks, Scott Shannon for some great times!) ended, finally moving in a more adult direction in the early 90s. It’s a more current-based format now than in 1996, but the AC factor is ever-present in this Independence Day recording of classics and Oldies, neatly wrapped in an exciting HotAC radio station. 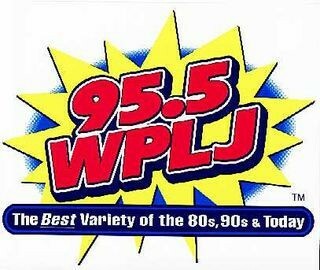 This is 95.5 WPLJ – and in July, 1996, it definitely was mom’s radio station!